The annual Hilton Head Island/Bluffton Chamber of Commerce Restaurant Week began yesterday. Here are some of our favorite local restaurants by category. What restaurants are you going to try or revisit? Visit the HHI/Bluffton Chamber of Commerce Restaurant Week webpage for a full list of participating restaurants. The Island Rec Center has undergone a transformation and it’s time for the debut! The ribbon cutting is scheduled for Thursday, January 31, 2019 at 12:00pm. New facilities include a new fitness center with rooms for fitness classes, a walking/jogging trail and new cardio and cable strength equipment. Memberships are available. Check out the Matterport 3D interactive tour of the new Rec Center done by Dynamic Vision 3D. The Rec Center also offers programs for children, pickleball, senior programming, aquatics and rentals of several local parks. Mild Weather–During the winter months, the average daily temperature rarely dips below 64°F, a great temperature for outdoor sports. Pet Friendly Beaches–From October 1 – February 28 you can bring your pet to the beach at any time. Sumptuous Seafood–“Low-season” is prime time for seafood, especially oysters which are featured at the Hilton Head Seafood Festival and at the culinary events during the Gullah Celebration. Will we see you in the low-country this winter? If so, you might like to plan your trip around some of our exciting events. January 24 – February 3, 2019–Lean Ensemble Theater presents A Doll’s House, Part 2 by Lucas Hnath. In the final scene of Ibsen’s 1879 masterwork, Nora Helmer leaves her husband and children to begin a new life. In A Doll’s House, Part 2, after many years, Nora has returned. Click here for more information. January 26, 2019–Bring the whole family to Hilton Head Snow Day at the Shelter Cove Community Park. This family event has rides, a snowfield and entertainment. Click here for more information. January 27 & 28, 2019–Hilton Head Symphony Orchestra, with John Russell Morris conducting, performs Tchaikovsky Symphony No. 6. Pianist, Drew Petersen is the featured guest artist. Click here for more information. February 1-28, 2018–Celebrate Gullah culture at the Hilton Head Island Gullah Celebration. Events are scheduled throughout the month of February. Learn about the Gullah culture through art, music, dance, food and other venues. Click here for more information. February 2, 2018—Some of the finest young instrumentalists from the southeastern United States will perform at the Hilton Head Symphony Youth Concerto Competition at SoundWaves. The winner will perform as a soloist with the Hilton Head Symphony Orchestra. Click here for more information. February 4-10, 2019–Indulge your taste buds at Chamber Restaurant Week, one of the area’s most popular events for dining out, trying new restaurants and enjoying old favorites. This year over 70 of the area’s top award winning restaurants will participate, all serving up value-priced, prix fixe menus. Click here for more information. February 9, 2019–Get ready for the Hilton Head Island Marathon, Half Marathon & 8K. The HHI Marathon is a Boston Qualifier course and has been selected as the 2019 Road Runner Club of America Marathon Southern Region Championship. It features a scenic course that takes participants through Spanish Wells, Point Comfort and Honey Horn Plantation. A portion of the proceeds will benefit several Hilton Head Island area charities including Hilton Head Rotary Club, Hilton Head Island High School Athletic Department, Bluffton ROTC and Hilton Head Christian Academy. Click here for more information. February 9, 2019–Save the date for the annual For the Love of Paws, a fundraiser benefiting Hilton Head Humane Association. Click here for more information. February 10 & 11, 2019—The Hilton Head Symphony Orchestra, with guest conductor, Rei Hotodan, will perform works from Beethoven Symphony No. 6, Debussy’s Clair de lune and Higdon’s Percussion Concerto. Click here for more information. February 12 – March 3, 2019–Come out for Noel Coward’s delightful comedy classic, Blithe Spirit. Intending to gather inspiration for his latest book, writer, Charles Condomine, asks Madame Arcati to hold a seance at his house. Despite initially thinking the seance was a failure, it soon becomes apparent that Madame Arcati brought back Charles’ first wife, Elvira, who causes all kinds of mischief between Charles and his new wife, Ruth. Click here for more information. February 14, 2019—The Sullivan Fortner Jazz Trio will be appearing at SoundWaves for a one night engagement on Valentine’s Day. Sullivan Fortner is one of the top jazz pianists of his generation and is recognized for his virtuosic technique and captivating performances. Click here for more information. February 18-24, 2019–The 12th annual Hilton Head Island Seafood Festival is a week-long culinary and cultural event showcasing talented chefs, local seafood, special events, live music and so much more. Each February seafood, barbecue and spirits lovers come from all over for the area’s largest culinary festival of its kind to celebrate southern heritage with food and drink. Click here for more information. March 10, 2019–Run in one of America’s top resort communities. Palmetto Bluff Marathon, Half Marathon & 10K are courses that loop the beautiful Lowcounty community of Palmetto Bluff. The marathon course is a Boston Marathon Qualifier course. The races start and finish in Wilson Village. Race proceeds will benefit Palmetto Bluff Conservancy. Click here for more information. March 11-17, 2019—Hilton Head Island Wine & Food Festival celebrates its 34th year of promoting tourism to the island. This is one of the largest outdoor wine festivals in the country. Experience spectacular wine dinners, educational seminars, live entertainment plus the Grand and Public Tastings. Click here for more information. March 11-18, 2019–Come and hear 20 of the world’s best pianists, ages 18-30, compete in four rounds of competitions before an international panel of jurors at the Hilton Head International Piano Competition, one of the leading international competitions in the United States. Three finalists will perform full concertos with the Hilton Head Symphony. Click here for more information. March 14 & 15, 2019–Experience Celtic Nights as world championship dancers and all-Ireland winning musicians perform storytelling through song, music dance and narration. Click here for more information. March 16, 2019–Get your Irish on and celebrate St. Patrick’s Day by running the Hilton Head Island Shamrock 5K Run. A portion of the proceeds will benefit a local Hilton Head area charity. Click here for more information. March 17, 2019—Come out for the 36th annual Hilton Head Island St. Patrick’s Day Parade, one of the island’s most beloved and popular annual events. Upwards of 25,000 spectators will line up to watch the floats, clowns, marching bands, Shriners and dignitaries make their way down Pope Avenue. Click here for more information. March 20-24, 2019–Lean Ensemble Theater presents Nora Anne Leahy’s If You Forget Me, a dark comedy exploring growing up, the nature of memory and the process of letting go. Kate’s engagement is called off following an accident that leaves her fiance with amnesia and no memory of her. Kate retreats to her childhood home to pick up the pieces of her life. Click here for more information. March 22, 2019–The Hilton Head Choral Society, joined by the May River High School Chorus, along with professional soloists and orchestra presents Spring Serenade. The program will include Franz Schubert’s Mass in G and songs from Rodgers and Hammerstein’s Carousel. Click here for more information. March 23, 2019–Mark your calendar for the Bourbon Ball, an Arts Center of Coastal Carolina fundraiser for the arts that is a hundred-proof fun! Laura Bell Bundy will perform Broadway and country favorites and entertain with her sassy southern charm. There will be bourbon tasting, delicious southern food and an outdoor cigar lounge. Click here for more information. March 28-30, 2019–It’s a night of rock and roll you’ll never forget! Get the Led Out brings the studio recordings of “the mighty Zep” to life on the big stage at the Arts Center of Coastal Carolina. Click here for more information. March 28 – April 13, 2019–The Savannah Music Festival presents a world-class celebration of musical arts. Come out and immerse yourself in the SMF’s timeless and adventurous productions that unite artists and audiences. Click here for more information. March 31, 2019–Join in the fun at the annual Hilton Head Easter Eggstravaganza, one of the very best Easter egg hunts on the island. There will be carnival games, zip lines, bounce houses and live music. Click here for more information. March 31 & April 1, 2019—Viva Italiano! Hilton Head Symphony Orchestra will perform works from two of the greatest Italian opera composers of all time, Giuseppe Verdi and Gioacchino Rossini. Click here for more information. April 6 & 7, 2019–Be swept off your feet! Hilton Head Dance Theatre presents Terpsichore, a production dedicated to both classical and contemporary dance. Click here for more information. April 15-21, 2019–Mark your calendars for the 51st Annual RBC Heritage, one of golf’s greatest traditions. Click here for more information. April 21, 2019–Don’t miss the Easter Egg Hunt in Sea Pines, an annual tradition. The Easter Bunny will be a part of the festivities. Click here for more information. April 25 – May 5, 2019–Lean Ensemble Theater presents Barefoot in the Park, a comedy from one of American Theater’s greatest playwrites, Neil Simon. Newlyweds Paul and Corie Bratter decide to play matchmaker to Corie’s loopy mother. Click here for more information. April 27, 2019—Take part in the American Heart Association’s signature fundraising event, Palmetto Heart Walk. The event features 3.1 mile walk and a 5K race and promotes heart-healthy living. Click here for more information. I hope we see you at one of these events! Please let us know us know if you have questions or if there is anything we can do to help. Selecting an agent to market your home can be daunting. How do you find the right agent to attract potential home buyers to your home? Our marketing system is designed to find people that are looking for a home on Hilton Head and give them the information that they need to get in their car and come to see your home. Call or email me today to find out how our proven system can get your home sold. This impressive townhome is located in Oyster Landing Club in the Club Course area of Sea Pines, a beach resort community on Hilton Head Island. This four bedroom, 3 bath home has stunning views across the marsh to the Calibogue Sound. With over 3,400 square feet this renovated home offers space to entertain friends and family or relax and unwind on the roof top deck. Additional space over the two car garage is perfect for an office, den or crafting space. Attractively priced at $1,075,000, call or text me for additional information or to schedule a showing. Experience the home by taking the Matterport 3D Interactive Showcase or by viewing the home video, links are below. Do a virtual walk through of the house using the Matterport 3D Showcase by clicking on the image below. 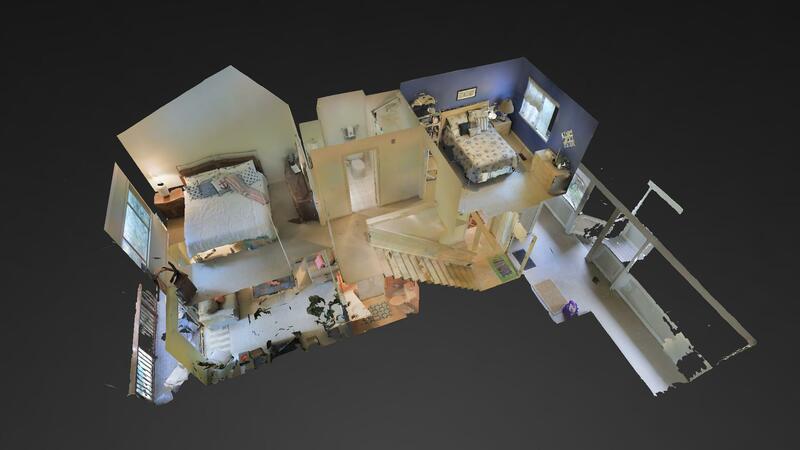 Matterport 3D Interactive Showcase Dollhouse View, do your own virtual walk through of the house. View the home video featuring Matterport 3D virtual walk through technology by clicking on the image below. Views across the marsh to the deepwater of the Calibogue Sound off Hilton Head Island from the rooftop deck. 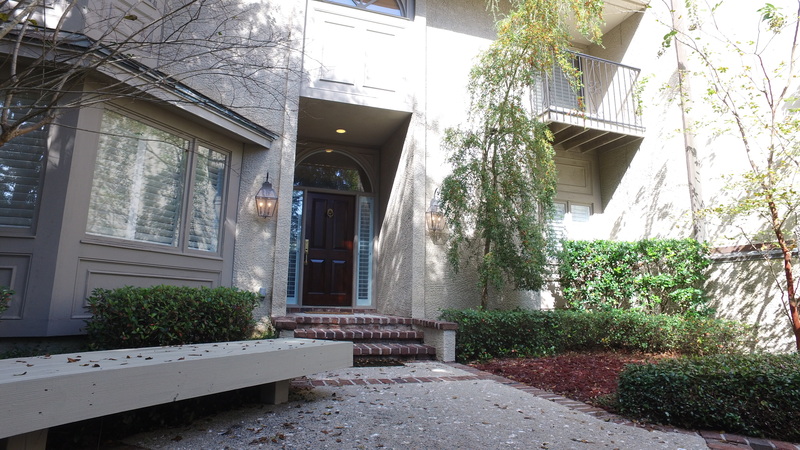 There are not many two bedroom condos this close to Hilton Head’s sandy beaches and priced so attractively. The seller is offering this villa for $175,000 and offering a $2,000 allowance for new appliances. This 2 bedroom, 1 1/2 bath villa is just 470 steps from the white sandy beaches of Hilton Head Island. The villa has just been staged, the furnishings are comfortable and it is being sold furnished so that it can be used or rented right away. This condo overlooks the community pool. Tanglewood Villas is a short distance from Coligny Beach Park and Coligny Plaza, a favorite place for visitors to shop, dine and enjoy entertainment.